Stress elevates cortisol, and staying up late throws off the body’s natural cortisol rhythm. Because cortisol is the fat storage hormone, chronic stress keeps cortisol elevated and encourages weight gain, particularly in the form of belly fat. The connection between stress and cortisol is one of the reasons that whatever aerobic exercise you choose should be one that you enjoy. Just following an early-to-bed policy for a week can reset cortisol levels. And, once you succeed in lowering cortisol, you have a greater chance of deep, restful nighttime sleep to help perpetuate early waking, daytime alertness, and future nights of restful sleep. How much sleep do you need? Sleep researchers tell us that the typical person, if free to choose, will sleep 8 hours and 15 minutes. I need a solid 8 hours, but I have family members who seem to thrive on much less (though they often nap in their chairs!). How much sleep is optimal is a personal matter. Do you wake up in the morning eager to get out of bed? Do you need stimulants like coffee to get going? Do you rely on caffeine to get through the day? Do you feel mentally “off?” Do you rely on naps? If you answer in the affirmative, chances are good that you are not getting adequate sleep at night. Strategies for sleep. Develop a relaxing bedtime routine and follow a regular bedtime schedule. Go to bed and get up at the same time (when possible). Try not to nap more than 20-30 minutes, and do not make napping a regular habit. Make sure the room is dark to help your body make melatonin. Avoid caffeine beyond lunch time and alcohol in the evening (it can awaken you between 1-3 a.m.). Because it takes energy to fall to sleep, a very light carbohydrate snack may help you drop off to sleep. Try to get some vigorous exercise each day, but not too close to bedtime; as well as exposure to the sun. Exercise. Aerobic exercise and lifting weights can counter the effects of stress-related cortisol. Enjoyable aerobic exercise helps burn off energy mobilized and stored in the muscles by stress. It helps reset the body clock from jet-lag. Exercise also heightens the body’s sensitivity to cortisol and insulin, so it can get by with less. Be sure to choose an activity you enjoy. Torturing yourself with exercise you dislike elevates cortisol and becomes self-defeating. Weight training builds muscle mass, which is important for metabolism since a pound of new muscle is estimated to burn 50 additional calories a day. Weight training helps to counter the normal muscle loss associated with aging: While muscle strength can be sustained through age 50, it tends to decline by about 20 percent through age 70, and by 40 percent by age 804. Lost muscle impairs balance and means slower metabolism, reduced insulin resistance and hormone function, lowered immunity, weaker bones, decreased conditioning and aerobic fitness. Massage; Yoga; Meditation; Prayer; Time Outdoors. These are all effective ways to lower cortisol, but only if they are activities that you enjoy. If trying to make time for a yoga class adds stress to your day and makes you feel guilty, sitting quietly in a chair listening to your favorite music might be a better choice. Whatever you choose should be fun, stress-free, and enjoyable. Cook, Knit, Play Games. If you like kitchen arts, cooking can relieve stress and be empowering. Cooking, like knitting, can be creative and offers a sense of control at least over a small portion of life. Eat Breakfast, Eat Lunch, and Enjoy Daytime Snacks. Breakfast is the most important meal of the day. We need food to meet the 6-8 a.m. cortisol crest of early morning. Try Not to Diet. Studies show that dieting is stressful and therefore boosts cortisol levels. 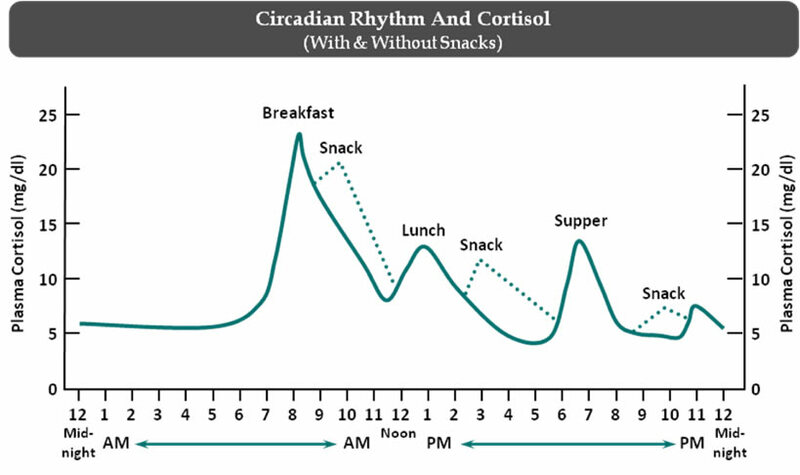 Eating at the right times of the day—breakfast, lunch, snacks, and an early dinner—helps keep cortisol on track.